Desi Cow Bilona Ghee is made from the Pure Indian breed’s desi cow’s whole milk and It is prepared by the bilona process. First we take desi cow’s fresh whole milk into one container. Then we add small amount of curd into the desi cow milk and after some hours whole milk is converted into the curd. After that we churn desi cow’s curd by bilona process. By churning process pure butter is generated. Then the butter is extracted from it in other container. Then the Desi cow’s butter is boiled on cow dung flame or stove. By boiling and shaking the butter, ghee is produced. Which has very nice smell and yellow color. It is very nice in taste also. Extracted butter milk is used for direct intake or in other food preparation. Desi cow buttermilk is also very healthy drink. This is Indian culture’s original and the best process to make the ghee from milk. This ghee contains the highest nutrition and quality.This ghee is also called Vedic Cow Ghee, Natural Cow Ghee, Pure Cow Ghee, Shuddh Cow Ghee, Organic Cow Ghee, Organic Desi Cow Ghee and Desi Cow A2 Ghee. 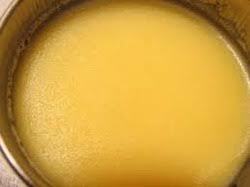 Vedic Cow Ghee – Our Ghee is made by Vedic process so it is also called Vedic Cow Ghee. Natural Cow Ghee – Our Ghee is made by natural process and all ingredients are natural. No artificial ingredient is being used. Pure Cow Ghee – This Ghee is 100% pure. No other animal milk is mixed or no any other substance is mixed in this ghee. Shuddh Cow Ghee – Shuddh means pure. Our Ghee is completely pure by ingredients and method. Organic Cow Ghee – While making ghee, no any chemical or preservative is used. So it is 100% Organic. Organic Desi Cow Ghee – The milk used to produce ghee is coming from desi cow breed. Milk and ghee both are 100% organic. Desi Cow A2 Ghee – Desi cow milk contains A2 protein and cross bread cow milk contains A2 protein. So the ghee produced from A2 type milk is called Desi Cow A2 Ghee. We don’t send cows to slaughter house after cow stop giving the milk. We take care them lifetime. We don’t torture cows to get more milk then regular. We don’t use any medicine to get more milk then regular. We don’t stop calf(daughter of cow) to drink mother cow’s milk. We don’t extract or remove cream from the whole milk while making bilona ghee. We don’t use milk of cross breed cows (Jersey, HF, Holstein, Ayrshire or any other hybrid) and buffaloes. We don’t use any aluminium vessel in the entire ghee making process. Desi Cow Bilona Ghee is used to prepare Indian Sweets. It will create best smell and taste. Desi Cow Bilona Ghee is used in regular home food preparation. It increases the digestion and give good stamina. Desi Cow Bilona Ghee is used as medicine in many ayurvedic treatment. All vaidya recommends this ghee for their medicinal purpose. Desi Cow Bilona Ghee is used in Diva in Jain and Hindu temples. It creates oxygen while burned in diva. If you want Desi Cow Bilona Ghee then please contact us. Bulk inquiry is also welcomed.